Traveler’s Red Alert World Grand Champion Amateur Three Year Old, owned by Jan and JoAnn Alford, Buffalo, Mo and shown by Jan Alford, Buffalo, Mo. Traveler’s Red Alert is a dark red sorrel three year old stallion. He is by the syndicated Mo. Traveler and out of my great show mare, Lad’s Special Promise. His exceptional ability comes from both sides of his pedigree. 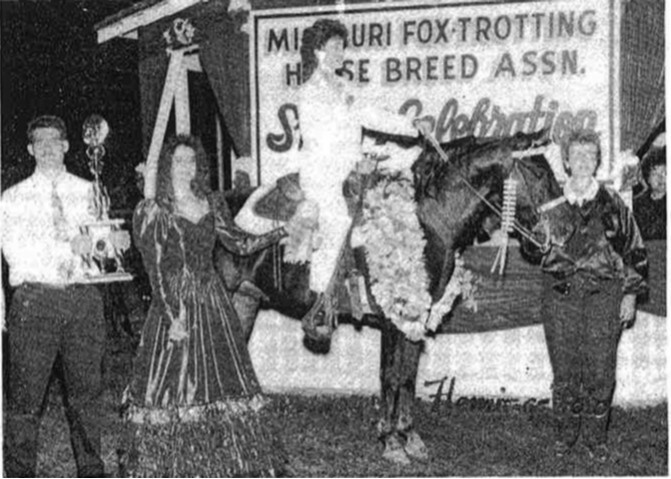 His dam, Lad’s Special Promise was the first 3 Yr. Old Futurity Champion in 1980. Her show career prematurely ended due to life-threatening laminitis .She is the daughter of the two time Reserve World Grand Champion, Zane’s Channing Lad and a maternal sister to our 1977 Reserve World Grand Champion, Zane’s Fancy Girl. His sire, Mo. Traveler needs no introduction, having already sired several World Champions. Red has been trained exclusively by Geno Middleton. Geno’s carefully designed training program has proven to be exactly what the assertive young stallion needed. His firm and knowledgeable guidance has produced a show horse that is both a pleasure to watch and an exhilarating challenge to ride. It has been a very successful year for Red Alert. 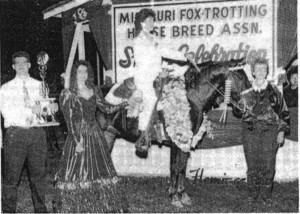 He began his show career by first winning the Stallions and Geldings division and the Reserve Championship at this year’s 3 Yr. Old Futurity. In July, he was named Mid-America Champion 3 Yr. Old. The culmination, of course, was capturing the title of Amateur 3 Yr. Old World Champion at this year’s Celebration. This talented young stallion has an abundance of natural ability which is reflected in his rhythmic way of going and true Fox Trot. We have great expectations for him as he develops into a confident senior competitor.